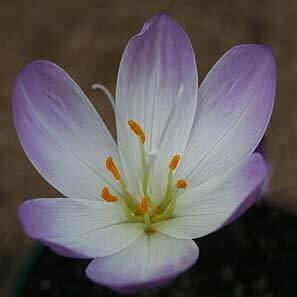 Colchicum are arguably the most attractive of all of the autumn flowering bulbs. A few species are included such as Colchicum speciosum, pictured right. Colchicum autumnale carries the common name of the ‘autumn crocus’ is from a genus of plants from Asia and the Mediterranean. Colchicum send up flowers before foliage, hence the name “naked ladies”, however with species and hybrids such as C. aggrippinum, C. autumnale Alba and C. byzantium that will bloom from midsummer through to spring. These bulbs grow best in a humus rich soil in part shade. Colchicum are a a very interesting species, well worth exploring in some depth. Colchicum or ‘autumn crocus’ are similar to crocus but are not related. Flowers appear before the foliage in autumn. A well drained soil with lots of rotted compost of peat. Keep moist in the flowering season. Plant in clumps for best effect. Colchicum can look great in pots. Try not to water during summer and choose a position with at least good morning sun for best flowering. These are a remarkably easy to grow bulb, summer dormant and coming to life when the rain begins and the weather begins to cool a little. They can be left to naturalise into a lawn, planted in the border, or grown in containers where the flowers can be shown off in style.